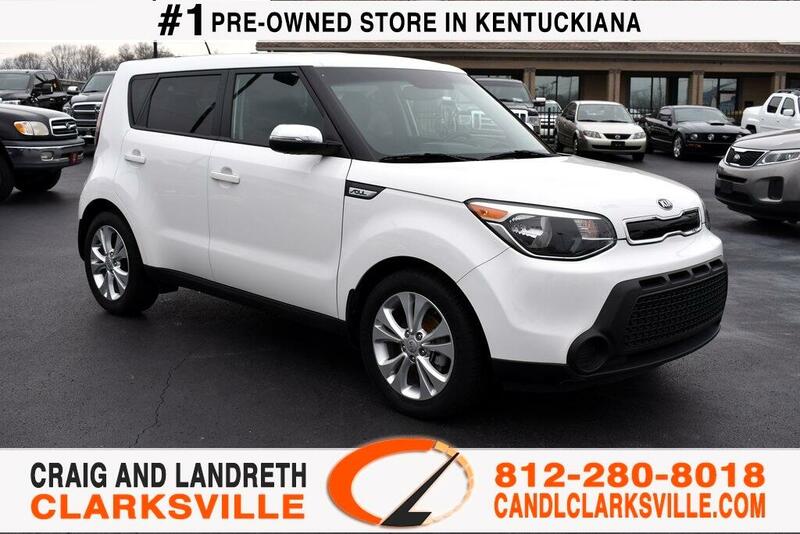 CERTIFIED BY CARFAX - NO ACCIDENTS 2014 KIA SOUL PLUS ** ONLY 21000 MILES AND THE SERVICE RECORDS ARE IMPECCABLE ** BLUETOOTH ** LOCAL TRADE AND HAS BEEN GARAGE KLEPT ** NON SMOKER VEHICLE ** SUPER CLEAN CARFAX ** COMES WITH A GREAT PREVIOUS OWNER RECOMMENDATION ** GREAT GAS MILEAGE ** POWER WINDOWS, LOCKS, MIRRORS * STEERING WHEEL CONTROLS ** YOU WILL NOT BE DISAPPOINTED WITH ANYTHING ON THIS VEHICLE! ANY QUESTIONS CALL RICHARD SPAN, JAKE SMITH, OR JIMMY SMITH JR AT 812-280-8018!! WE'VE NEVER LOST A DEAL WHEN IT CAME TO PRICE OR QUALITY!! Fresh oil change, White glove detailed, 110 point safety inspection, Bluetooth, USB, Satellite Radio/ Sirius XM, Non-Smoker, Local Trade, Lots Of Options, Technology Package. Certified. Certified by CarFax. Odometer is 43645 miles below market average! Kia Soul Plus HAS BEEN INSPECTED BY OUR SERVICE DEPARTMENT WHO COMPLETED A 110-POINT REVIEW TO ENSURE QUALITY AND DID ALL THE ROUTINE SERVICE. WE HAVE THE CLEANEST PRE-OWNED VEHICLES IN KENTUCKIANA! LET US SHOW YOU THE DIFFERENCE.